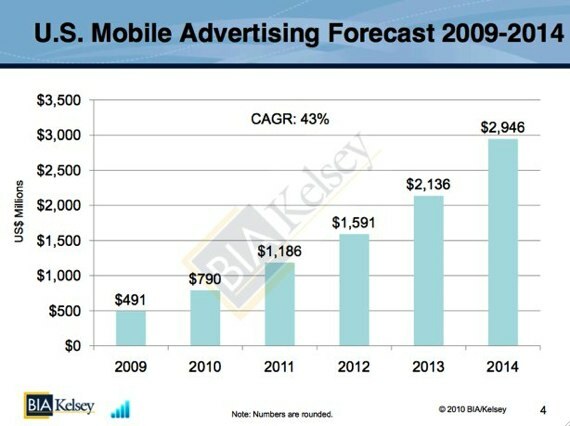 It’s no surprise that the mobile advertising market is growing like gangbusters. Today, BIA/Kelsey is releasing a new report that shows that U.S. mobile advertising revenues will grow from $491 million in 2009 to $2.9 billion in 2014. The study evaluates any advertising placed in mobile search (text advertising applied to search queries on mobile devices), display (display advertising applied to app and mobile Web inventory) and SMS (commercial SMS messaging). 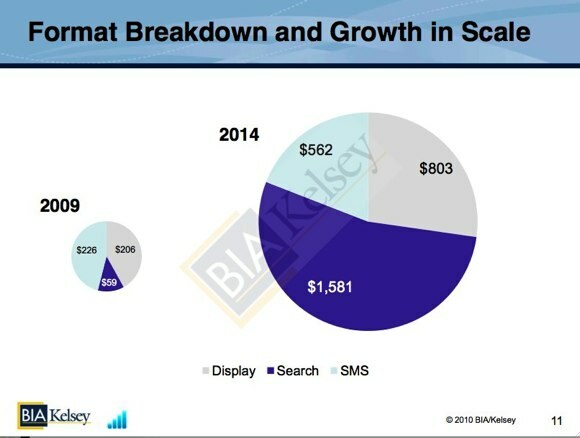 During the forecast period, BIA/Kelsey expects U.S. mobile search ad revenues to grow from $59 million to $1.6 billion, U.S. mobile display ad revenues to grow from $206 million to $803 million, and U.S. mobile SMS ad revenues to grow from $226 million to $562 million. 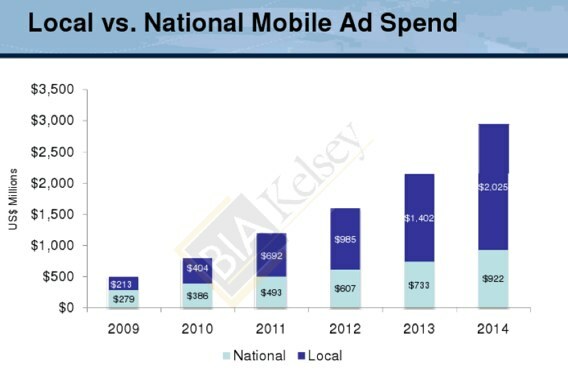 In terms of the local breakdown, BIA/Kelsey expects U.S. mobile local advertising revenues to grow from $213 million in 2009 to $2.03 billion in 2014. This represents 44 percent of total U.S. mobile ad revenues in 2009, growing to 69 percent in 2014. BIA/Kelsey defines mobile local advertising as ads that are targeted based on a user’s location. In a statement, the company said that as mobile advertising movies to the SMB and mid-market segments, there will be an increase in advertisers adoption as well as a growth in geo-targeted (i.e. local) ad spends. 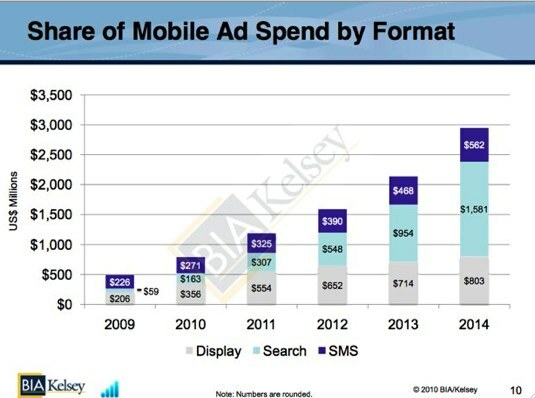 It’s interesting to see that mobile search advertising has the biggest potential to grow over the next few years. This represents a huge opportunity for Google, who dominates web search advertising. Of course, Bing could also stand to reap the benefits of mobile search ads as well. It’s important to note that steady increases in the use of smartphones and new innovations in mobile ad formats also are contributing to an rapidly growing market.